Total Knee Arthroplasty (TKA), also known as total knee replacement, is an orthopedic surgical procedure performed on the knee. TKA is a treatment option for those with a worn-out knee joint, one of the most common causes of which is the wear and tear associated with arthritis. When a TKA is performed, the defective cartilage is removed between the joint, the ends of the bones that meet at the joint are reshaped and fitted with metal implants, and a plastic piece called a spacer is put in between the metal implants so the bones can move smoothly without touching each other. There is significant rehabilitation required after a TKA, and it can take a few months before patients are able to get full functionality of their knees. While it is normal to feel significant pain after a TKA procedure, some people feel joint pain that is not associated with the healing process after a TKA. Here are some reasons why a patient may feel joint pain after a TKA. Implant Issues – Sometimes, the metal implants and plastic spacers are painful after a TKA; that’s because, over the course of time, these implants may have loosened up or are worn down due to use. Infection – Like with any invasive surgery, there is a chance of infection. You will have to work with your doctor to reduce or eliminate your risk of infection by taking precautions as prescribed by your doctor. If an infection does occur, it will likely be right after the surgery while the wound healing. If you see any signs of an infection such as redness, swelling, or a discharge, contact your doctor immediately. Alignment Issues – Another reason a patient may experience joint pain after a TKA is due to poor alignment of the implants. If your knee hurts even after the wound has healed and you have completed your course of physical therapy, it’s possible the implants are the misalignment. As soon as you notice something is off, contact your doctor. 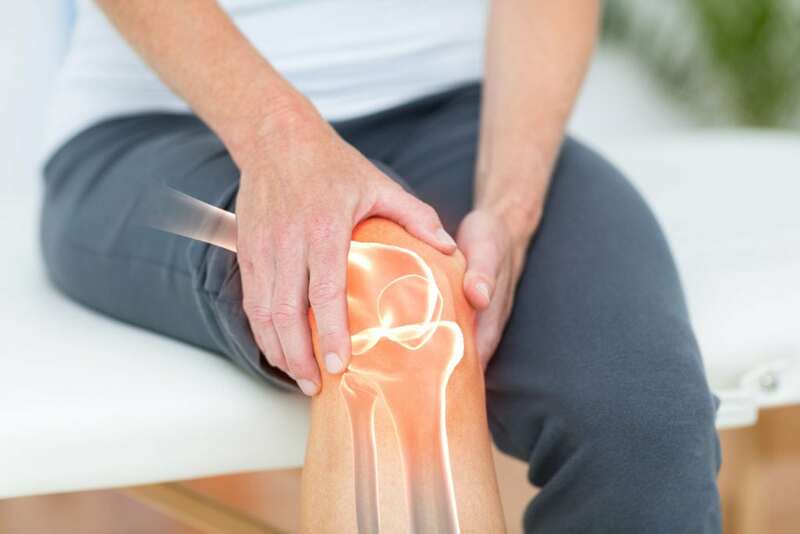 Other Issues – It is also possible that your joint pain is caused by other issues such as a pinched nerve or another condition that is indirectly causing pain in the knee. Your orthopedist can diagnose the cause. So what should you do if you have painful joints after TKA? Write down details of the pain. As you read above, joint pain can happen for a variety of reasons. To figure out what is causing the pain, you need to understand when and where the pain happens. You may experience pain right after exercising, right after waking up in the morning, or while driving a care. Your pain may go away after moving the joint after it hasn’t moved for a few hours or it may go away once you rest the joint for several hours after an activity. You may experience pain occasionally or every time you do a certain activity. Finally, your pain may be accompanied by swelling, stiffness, or other symptoms that are significant. All of these clues will help your surgeon determine what the cause of the pain is. Make sure to write down every time you experience pain so that you can discuss it with your surgeon or doctor. Talk to your surgeon or doctor. The best thing to do if you are experiencing pain after a TKA is to discuss it with your surgeon or doctor as soon as possible. Many knee issues can get worse over time, so time really is of the essence. After examining your knee and figuring out what is causing the pain, your doctor will recommend treatment options based on the cause. Seek relief. If you are experiencing pain, try applying an ice pack to your knee. Wrap an ice pack in a cloth and apply it to the knee in 15-minute intervals. You may also take over the counter anti-inflammatories such as Aleve or Motrin, or your doctor may prescribe you pain-reducing medication. If you are experiencing pain a few months after your TKA procedure, you may need to pace yourself as your body heals and learns to function. Finally, physical therapy can also help with pain by strengthening and increasing the flexibility in your knee. Suffering from joint pain can be debilitating to your lifestyle and overall happiness. Seek medical advice if you are suffering from pain knee pain after a TKA procedure. There are many solutions to treating the cause of your pain or managing your pain symptoms. If you are experiencing knee pain after a TKA, talk to your doctor as soon as possible. Personalized Orthopedics of the Palm Beaches has a wealth of knowledge and experience on joint pains and TKA procedures. If you are suffering from knee pain after a TKA, call 561-733-5888 today to make an appointment with one of our experts.